Over the past few years, retail developer Edens has transformed a gritty wholesale market and a suburban multiplex into trendy retail destinations. Their next redevelopment project, a dying strip mall in Burtonsville, might be a little more challenging. 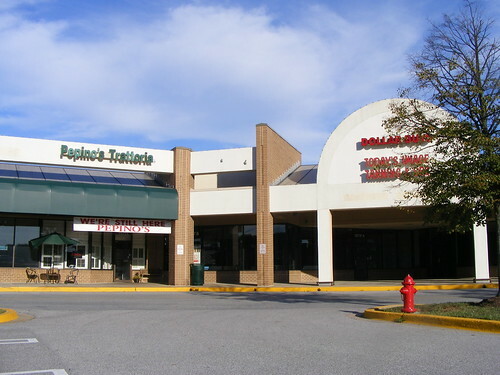 One of the few remaining businesses at Burtonsville Crossing. Photo by the author. Burtonsville Crossing, on Route 29 in eastern Montgomery County, has been hemorrhaging tenants since a highway bypass was built behind it in 2006 and is now 70% vacant. This week, Edens, which has owned the strip mall since 2003, signed an agreement with the county to explore ways to redevelop it and a six-acre park-and-ride lot behind it. Montgomery County seems to expect big things from the developer. 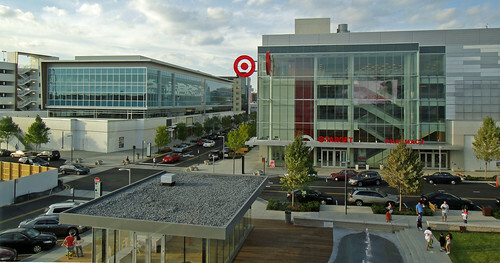 Their press release states that Edens is "known locally for the popular epicurean mecca Union Market" in Northeast DC, and describes "conceptual plans" for restaurants, retail, housing, and a movie theatre, which sounds like the Mosaic District, a mixed-use development Edens is building next to the Dunn Loring-Merrifield Metro station in Fairfax County. Burtonsville, a mashup of farms, subdivisions, and apartment complexes next to the Patuxent River, has been economically struggling for years. Office buildings built during the 2000s still sit empty, while a new shopping center across from Burtonsville Crossing continues to have vacancies. While some neighborhoods remain relatively affluent, local schools are experiencing white and middle-class flight, and some areas now have poverty rates exceeding 20%. County leaders see the park-and-ride lot as key to the area's resurgence. A 2012 master plan for the area identifies it as the location of a mixed-use neighborhood, with up to 600 homes alongside shops and offices. But Giant, which used to be at Burtonsville Crossing before moving across the street, still owns their former store and is allowed to block new tenants who could compete with them, effectively blocking redevelopment. Building on the park-and-ride allows Edens to go around Giant and bring in an anchor store who could attract other businesses. The Mosaic District. Photo by Payton Chung on Flickr. While the details are still sketchy, this project could give this aging suburban community a new center, much in the same way that Edens has done for the Mosaic District. Ten years ago, Mosaic was a multiplex in a sea of parking. Today's it's becoming a walkable neighborhood, with an art-house movie theatre, a Target, and locally-owned shops and restaurants surrounding a public plaza. New townhouses there sell for upwards of $700,000, while thousands of apartments are popping up nearby. The circumstances in Burtonsville are a little different. For starters, it's a relatively spread-out, low-density community that doesn't seem to have the critical mass to support the retail that already exists. Unlike Union Market, which is in an area with little retail, a 2007 market study found lots of retail competition for Burtonsville, like Maple Lawn, a walkable retail district three miles north in Howard County, and the new Towne Centre at Laurel lifestyle center a few miles east. Unlike Mosaic District, there's no Metro station nearby, though there are plans for a Bus Rapid Transit line between Burtonsville and Silver Spring. But after years of bad news about Burtonsville, the county's press release suggests a hint of confidence about what could happen there. County officials will start negotiations with Edens shortly, meaning we'll probably see more details in the months to come.